Let the battle between good vs evil, light vs dark commence with Lite Brix LITE WARS! 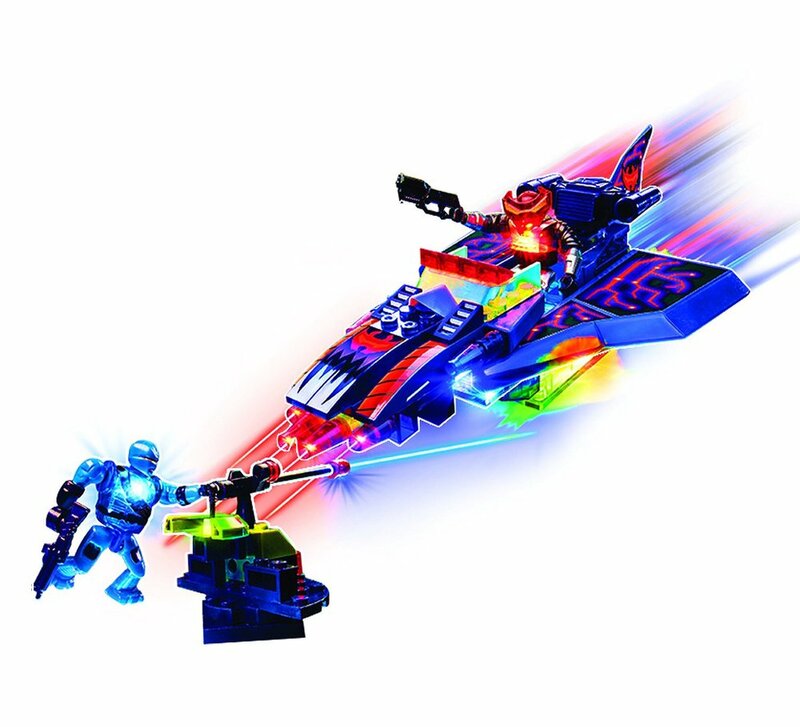 This pretty awesome action packed construction set enables you to build a slayer jet with 2 cannons using Lite Brix lighted building bricks, which feature four colour LEDs that come to life when connected to the mini LED battery power pack. Also features Includes 1 light up Hell Fire mini figure and 1 Captain Bolt light up mini figure. The Black Guard, the evil army of darkens has discovered origins of the Blazer's power source Lumitron. They are threatening to destroy the existence of light and humanity. This army of terror is determined to capture the power source for their own sinister use. The Blaze Force protectors of the light must journey to the darkest corners of the world where they will fight in epic battles to save the future of Lumitron…the future of light itself. Lumitron is the ultimate power source; it powers all things from vehicles to buildings to battle weapons. Blazer Force has harnessed the precious resource into a fuel which they protect from the evil intentions of the Black Guard. 1 lite brix, 87 brick blocks, 8 special shaped parts, 2 lite up figures, 1 mini LED battery power pack, 1 Decal sheet, 1 instruction manual. This construction set is wicked, it lights up and everything. It all starts with the comic book style story on the back of the box, it gets you ready for what you're about to build. Because what you are about to build is a matter of life and death for the Blazers if they don't keep the Lumitron away from the Black Guard. The parts come in little bags ready to put everything together and the instructions are in handy picture form, perfect for children with little reading skills. However, it is very fiddly and the instructions are quite complicated to read. We had to start again a few times because we'd not put the bits in the right place. We also kept breaking it whilst placing the next bit on. It's quite flimsy. The fact it lights up is a great feature though and when you finally fit it all together it looks awesome. The little figures also light up, making it brilliant fun to play with in the dark. Sometimes a little gimmick, like lights, makes a toy stand out from all the rest. This is a great toy for a child over 6 with good concentration and a love for building. It may need a bit of help to make though and make sure you have some AAA batteries on hand and a tiny screwdriver to fit them. Requires 4 LR41 Batteries (included) and 3 AAA Batteries (not included).